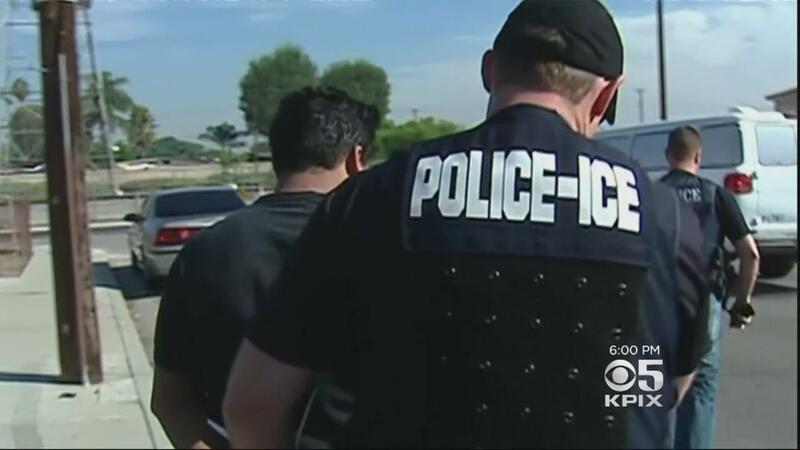 SAN FRANCISCO -- U.S. Immigration and Customs Enforcement (ICE) agents arrested more than 150 people since the weekend in the greater San Francisco Bay Area who they say were in violation of federal immigration laws during activity, ICE officials announced Tuesday. The numbers came from a press release issued by officials, CBS San Francisco reports. ICE agents and Enforcement and Removal Operations (ERO) deportation officers started conducting what the agency termed "targeted immigration enforcement operations" in the area Sunday. The aim of the operation was to arrest individuals who have violated U.S. immigration laws. Agents worked on leads developed by the local field offices in conjunction with the National Criminal Analysis and Targeting Center (NCATC). According to the press release, about half of the individuals arrested also had past criminal convictions in addition to their immigration violations, including convictions for assault and battery, crimes against children, weapons charges and DUI. The operation was a continuation of ICE's efforts to prioritize enforcement against public safety threats, according to officials. A similar operation was conducted in Los Angeles earlier in February. In that operation, 88 percent of those arrested by ICE were convicted criminals. The press released stated that in fiscal year 2017, ICE arrested 20,201 aliens throughout California and claimed that 81 percent of of those individuals were convicted criminals. "Sanctuary jurisdictions like San Francisco and Oakland shield dangerous criminal aliens from federal law enforcement at the expense of public safety. Because these jurisdictions prevent ICE from arresting criminal aliens in the secure confines of a jail, they also force ICE officers to make more arrests out in the community, which poses increased risks for law enforcement and the public," said ICE Deputy Director Thomas D. Homan. San Francisco Mayor Mark Farrell was defiant, saying in a statement, "San Francisco is and will always remain a Sanctuary City. We have made it clear to the Trump Administration that San Francisco's Sanctuary City laws are in compliance with federal law. If the federal government believes there is a need to detain a criminal, we will honor a criminal warrant. As the Trump Administration pursues their political plan of haphazardly punishing sanctuary cities, we will not cower. We stand with our hardworking, law-abiding immigrant neighbors and we are unified in our response to the divisive rhetoric of this President. In collaboration with our community based organizations, we have established a 24-hour multilingual rapid response hotline to respond to the heightened enforcement actions by U.S. Immigration and Customs Enforcement." Homan also singled out Oakland Mayor Libby Schaaf for the warning that she issued Saturday prior to the beginning of the operation. "The Oakland mayor's decision to publicize her suspicions about ICE operations further increased that risk for my officers and alerted criminal aliens -- making clear that this reckless decision was based on her political agenda with the very federal laws that ICE is sworn to uphold," said Homan. Days later, Schaaf said she by her actions, but her critics claim the warning she gave was reckless and may have been illegal. Former federal prosecutor Tony Brass said putting out a public warning about a planned immigration sweep may have crossed the line. "She's on the threshold of obstruction of justice for doing what she did," Brass said. "Because you put agents in danger. You put the police in danger and you put neighbors in danger." "I was sharing information in a way that was legal and was not obstructing justice, and it was an opportunity to ensure that people were aware of their rights," said Schaaf. Still, there could be repercussions. "What's going to happen is that federal agents are going to stop talking to local police agencies," Brass said. "And the reason that communication is so vital is for safety. For safety of everybody." The warning also led to a number of angry phone calls to the mayor's office, some accusing her of treason. A spokesman for Schaaf on Monday said the calls and social media messages were largely from out of state and called for her to be removed from office. Among those arrested during the operation was 38-year-old ICE fugitive Armando Nuñez-Salgado in Napa on Sunday. Family members told CBS San Francisco Nuñez-Salgado was involved in gangs and drugs for a long time. At one point, he was on ICE's most wanted list for charges of felony force and assault with a deadly weapon. According to ICE officials, he was a documented Sureño gang member who has been previously been deported on four prior occasions. Over the past 18 years, he has had criminal convictions in California for assault with a deadly weapon, burglary, injury hit-and-run and other crimes that have resulted in prison sentences totaling more than 15 years. The press release asserted that ICE "does not conduct sweeps or raids that target aliens indiscriminately, and the agency prioritizes public and national security threats, immigration fugitives and illegal re-entrants." ICE said some of the individuals arrested will face federal criminal prosecutions for illegal entry and illegal re-entry after deportation. The arrestees not being federally prosecuted will be processed administratively for removal from the United States. Those with outstanding orders of deportation, or who returned to the United States illegally after being deported, are subject to immediate removal from the country, ICE officials said. The remaining arrestees are in ICE custody awaiting a hearing before an immigration judge, or pending travel arrangements for removal in the near future. The Enforcement and Removal Operations' San Francisco area of responsibility extends from the Bakersfield area north to the Oregon border and includes 49 counties, according to ICE officials.